Is horror the best genre to pick if you’re looking to make a film for the first time? It’s easy to see why so many people do. With a simple script, a few quid to cover production and some willing cast and crew you could be shooting in no time. Even if you’re a seasoned professional, a bit of death and destruction is often the way to go if you’re looking to stir up a fuss about your film. Yup, horror can be a cool option. The downside is that if you do it badly then horror looks more than a little bit lame. And those sniffy industry types look down their noses at you for having a go. Nevertheless, horror is more popular than ever and there are plenty who want to take on the genre and deliver their own unique take on this glorious blood and guts movement. I say movement because that’s another plus with making a horror film – the fans. Get the horror fans on your side and you’re going to be off to a great start as they are simply so supportive. 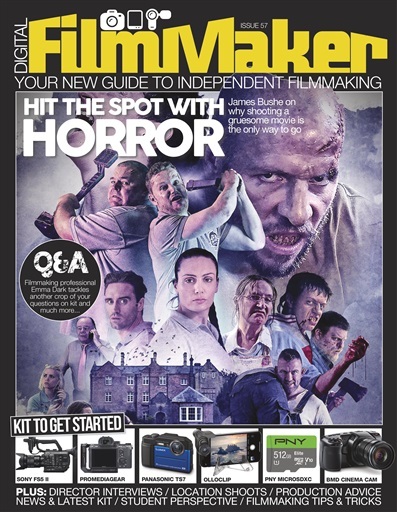 That’s why our cover and the lead feature this issue is all about Cannibals & Carpet Fitters, a brand new horror romp from James Bushe. 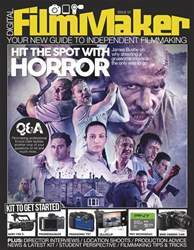 Head on over to page 10 to see why he thinks horror is hard to beat when it comes to filmmaking; it’s a great story.